Nacho Vigalondo’s first feature, 2007’s Timecrimes, was a wildly adventurous and imaginative time-travel romp that has since rightly become part of the cult cannon. It was an idea-filled mindfuck that kept changing directions with ease while maintaining an atmosphere equal parts foreboding and fun –what was most impressive about Timecrimes was how Vigalondo treated the film’s increasingly ridiculous plot with the utmost seriousness while keeping a carefree, anarchic feel throughout. He accomplished all of this with the same amount of money a major studio allots in any given production for a day’s crew meal. Almost five years later he has made another science fiction-y film, again on a shoestring. 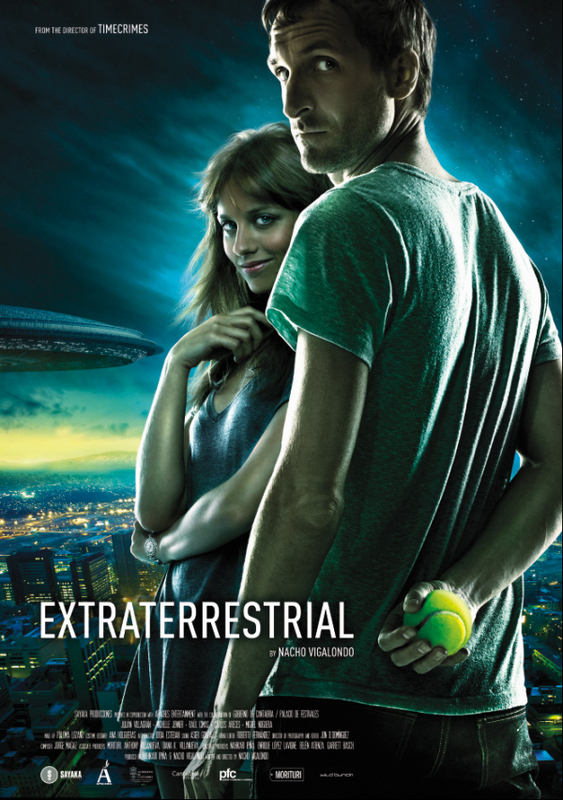 This time around, Vigalondo has dropped most of the moody creepiness of Timecrimes and made the very entertaining Extraterrestrial, an alien invasion romantic-comedy. Julio (Julián Villagrán) wakes up, hung over, in a bed belonging to Julia (Michelle Jenner). Neither remembers much of the night before, so essentially they are meeting for the first time. As they make awkward conversation, Julio and Julia notice a gigantic spaceship hovering over the deserted neighborhood. Their deadpan, matter of fact reaction to this fantastic finding sets the tone for the rest film. They learn from Julia’s creepy, stalker neighbor, Carlos (Raúl Cimas), that thousands of spaceships are also hovering in cities throughout the globe though no contact has been made with their occupants: the UFOs ominously float over the skies doing nothing. During these expository scenes, Vigalondo keeps the pace deliberate, milking the tension for dry laughs and small snips of character development, as the two young “lovers” hesitate to do anything as they digest the earth-shattering news. The two characters’ discomfort, along with the film’s pace, picks up considerably with the surprise appearance of Ángel, Julia’s heretofore unmentioned boyfriend, fresh from exploring the forsaken streets. From this point forward Extraterrestrial becomes a farce exploring the extremes these people are driven to by desire, paranoia, and boredom. Vigalondo keeps the action mostly confined to the apartment as his characters lie, cheat, and plot against each other. Though the protagonists behave awfully, they’re kept from being one-dimensional, loathsome caricatures by the screenplay and the performances. The laughs in Extraterrestrial come from the aggregate effect of the character driven plot and the director’s sharp eye for detail. Vigalondo keeps significant objects around and squeezes as much comedy from them as he can. The fate of a gigantic jar of preserved peaches is particularly funny while driving the plot forward. While I don’t think this movie is for everyone, the very dark humor and sometimes slow pace might be a turn off to some, it is an incredibly well-crafted piece of entertainment. I just hope Vigalondo doesn’t wait another five years for his next one.